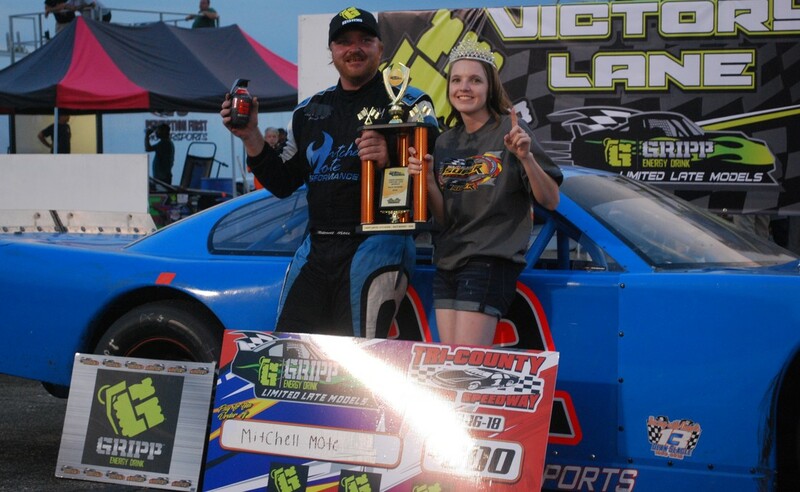 The Gripp Energy Limited Late Models have sure put on a fantastic show each week, however it has sometimes been a battle of endurance and stamina at the end of the races. They rolled into the Piedmont of North Carolina on Saturday June 16, 2018, at Tri-County Motor Speedway in Hudson, NC. This was the hometrack to a few of the drivers Dillon Houser (who has also won the first three races of the season in the GELLM division), Chris Phipps, and the teams right over the mountain in Asheville. The drivers and teams prepped their cars for the first round of practice, after unloading them inside the 4/10ths mile oval. It was local home town favorite Houser, who found his way at the top of the charts. He was followed by Jesse Clark and Ralph Carnes. They headed back to the garage area, to make any necessary adjustments needed. Houser once again topped the speed charts in the second round of practice, followed by his teammate Phipps in second, and Alan Rich in third. They headed back to the garage area, to bolt on their race tires, and head to the tech area. Qualifying was up next, Chris Phipps claimed the Renegade Race Fuels Pole Award. Houser was second fastest, Clark third. Phipps rolled a three on the invert dice, which now set Clark on the Pole. As the field rolled around the track for their pace laps, the rest of the field followed Clark and waited on him to kick things off. However Houser was quick to make the move on Clark and take the top spot away. Houser began to pull away from the field, until fifteen laps in the race, he started feeling pressure from his teammate Phipps. Once Phipps caught Houser, the pair put on a show for the fans, both racing side by side lap after lap. The first caution flew on the field on lap 21, as #14 Davey Smart went through a spin cycle coming out of turn four. Houser paced the field back to the green flag, with quick pressure from Phipps. They raced each other hard for two laps, until the caution flew again due to a multiple pile-up in turn two. Jonathan Flemming made contact with John Gallman, then collected the #65 of John Mamph, #10O Randy Ollis, #4D James Dolan, and #14 Davey Smart. Houser once again led the field back to the green flag, this time Phipps wasn't going to allow Houser to get away. They raced side by side giving it their all. Clark and Carnes began to battle it out, racing for the third position. Greenville, South Carolina's Mitchell Mote sneaked his way into the top five, and moved past Carnes, and Clark taking over the third spot. Meanwhile a three way battle for fourth broke out between Clark, Carnes, and Tanner Brookshire. Phipps was finally able to capitolize and take the top spot away from Houser, until the caution flew again with just seven laps remaining in the feature. Smart spun again coming out of turn four. Phipps led the field back to the green flag, with Houser on the outside. The pair raced side by side going into turn one, they touched sending both drivers spinning and collecting the #4D machine of Dolan. Now that Houser and Phipps went to the rear of the field, this now allowed Clark to lead the field back to the green flag. The #22 machine of Mote made slight contact with the #5 of Clark, which resulted in damage to Clark and appeared as if he had cut a tire down. ​The caution flew again before they could complete a lap, Clark came down to the aid of his crew and re-joined the field. Mote rolled to the green flag as the leader. Houser and Phipps were working their way back up to the top five. The caution flew again, one lap later as the #55 of Brookshire got spun in turn two, collecting the #37 of Phipps. Mote led the field back to the green flag, and went on to pull away the last six laps of the race. He was followed by Carnes in second, Gallman in third. The Gripp Energy Limited Late Model division will be back in action at Anderson Motor Speedway on June 30th.